YaleNet - Smart Matters - S.O.S FEST 2011 "ARRESTED DEVELOPMENT"
COMMUNITY RESOURCE FAIR & MUSIC FESTIVAL!!! PRESENTING SOCIAL SERVICE PROVIDERS TO ASSIST YOU & YOUR COMMUNITY! The goals of the festival are twofold. are for them to use as individuals and for their community. address the problem of recidivism. HIGHLIGHTING BEHAVIOR MODIFICATION THROUGH THE PERFORMING ARTS! THE BEST OF GOSPEL MUSIC FROM ACROSS THE CITY & STATE: ROCK, RAP, CONTEMPORARY & TRADITIONAL! 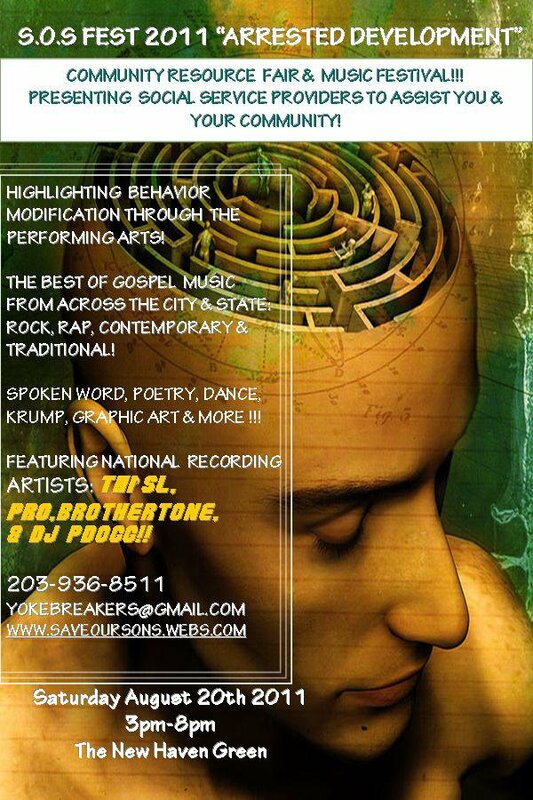 SPOKEN WORD, POETRY, DANCE, KRUMP, GRAPHIC ART & MORE !! !